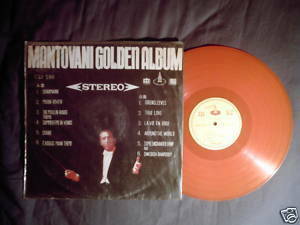 CSJ 589 orange vinyl LP (Taiwan) Mantovani Golden Album Charmaine/Moon River/Moulin Rouge Theme/Summertime in Venice/Diane/Eexodus (sic) Main Theme//Greensleeves/True Love/La Vie En Rose/Around the World/Some Enchanted Evening/Swedish Rhapsody. Record and cover are in very good condition. Most tracks play VG. Writing on labels (Taiwanese on one side, one x on the other). Opening track was featured by Nurse Ratched in the film One Flew Over the Cuckoo's Nest.